The box office for Castlerea Musical Society's production of Jesus Christ Superstar is NOW open. Seats can be selected and purchased online at http://www.castlereamusicalsociety.com/tickets. Thanks to all the team at Gr8events.ie for their help in enabling us to provide this online booking service to our patrons. 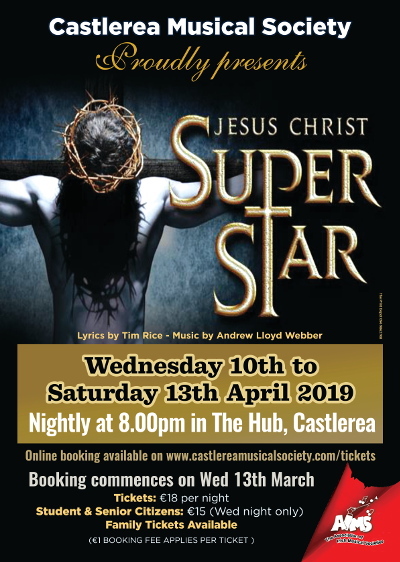 The Society will present Jesus Christ Superstar from Wednesday 10th - Saturday 13th April, at 8pm nightly in The Hub, Castlerea.